In 2005 Gemma Isaac’s mother, Emma, was diagnosed with breast cancer. “Sing me a song,” said her mother. As Gemma sang, she felt the mood in the room shift. As she finished, another patient in the room requested a song of their own. Then another. And another. Suddenly, the entire experience of receiving chemotherapy changed from a grim experience to a joyful one. Gemma and her mom left that day a little happier and brighter than usual. And she didn’t know it then, but that moment planted a seed that would change her entire life. Gemma has been singing since she was three years old. Her parents always encouraged her to pursue her passion and she secured her first professional gig at just 13 years old. “I’ve been singing throughout my whole life,” says Gemma. Her talents led her to getting accepted into the prestigious American Musical Dramatic Academy in New York. Tragically, Gemma would never make it there. A week before moving she was involved in a serious car accident and the injuries she sustained prevented her from leaving Vancouver. Gemma first moved to London, but the lingering injuries were too difficult to manage on her own. So she moved back to Vancouver and joined Langara College’s Studio 58 — a local theatre program. In two years she graduated and left to work for Disney, performing on stage as different princesses such as Mulan and Jasmine. This is when her mother was diagnosed with breast cancer. As her mom struggled, Gemma wanted to be there and support the woman who had supported her throughout her whole life. It was during this time Gemma also felt lost. She had tried a number of different jobs throughout the years but nothing seemed to stick. Then her mom did what moms do best — she gave her daughter a little nudge in the right direction. Emma told Gemma about a type of work she had heard about called Music Therapy. A quick Google search later and Gemma felt something spark inside of her. “I learned it was evidence and research-based; a mix of the arts and science,” says Gemma. Music therapy is the discipline of combining the use of music with the personal qualities of a therapist as a treatment for rehabilitating, maintaining and improving the lives of persons with emotional, cognitive, spiritual, psychological and physical needs. It has shown to be an effective tool for people of all ages and abilities, with patients in the Burn, Trauma, and High Acuity Unit (BTHAU) like Sammy Badger receiving care during traumatic situations. “I thought, I love science, and I love music. This might be my calling,” says Gemma. 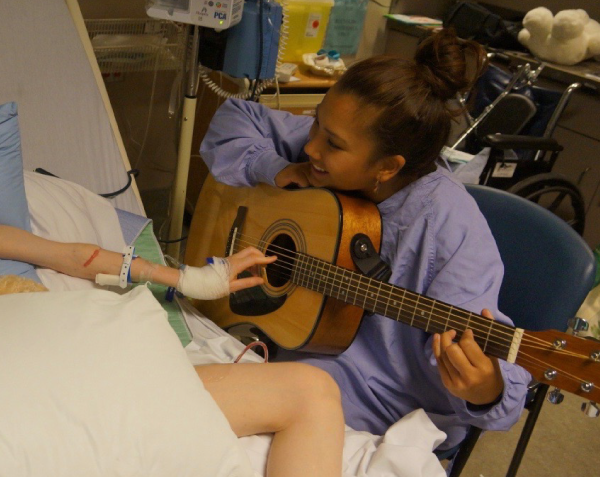 Two years later, Gemma was an official Music Therapist in BTHAU at Vancouver General Hospital. Her mother, Emma, received six treatments of chemotherapy and beat her cancer. Gemma has spent eight years at VGH and still feels grateful to work with patients who are dealing with some of the most painful and traumatic injuries you can get — major burns, lacerations, breaks and more. But she knows the power of her work every day when she sees the relief in patients’ faces as they work together, musically. 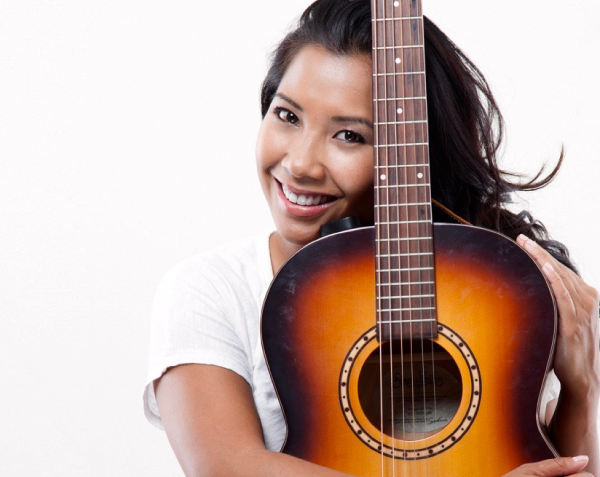 Music Therapy is available at several Vancouver Coastal Health facilities such as GF Strong Rehabilitation Centre, VGH’s BTHAU, Palliative Care, and Willow Pavilion Psychiatry Units. Learn more about Music Therapy and other Allied Health Professions. Sign up below to learn more about programs like music therapy that your donations help support.